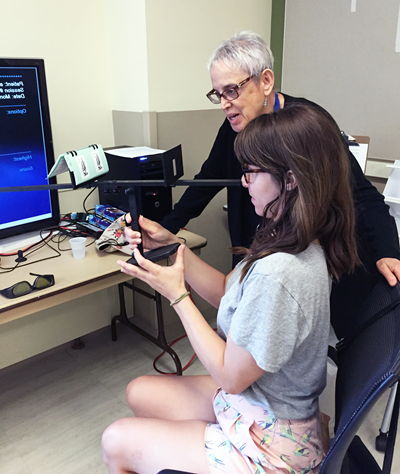 To meet the growing demand for disability-related medical and public health services, Salus University established the Institute for Multisensory Rehabilitation (SIMR). SIMR is a patient-centered interprofessional initiative with patient care, education, and research components. SIMR offers collaborative services including specialized vision care, hearing and balance, speech-language pathology, and occupational therapy to patients with acquired brain injury. Following acquired brain injury (ABI), patients may report physical, sensory, cognitive, and behavioral/emotional changes. Many conditions are typically overlooked in patients with acquired brain injury including sensory impairments such as vision disorders, hearing loss, tinnitus, and vestibular problems. Dual sensory impairment has been documented in veterans with blast-related traumatic brain injury (TBI). Audiologic and visual evaluations indicated that 19 percent had auditory impairment, 34 percent visual impairment, and 32 percent had dual sensory impairment. Similar issues have been reported in the civilian population with mTBI with problems such as vision disorders, vestibular system deficits, exercise intolerance, speech and language problems, and memory issues. In regard to the visual system, numerous studies have found a high prevalence of binocular vision (eye teaming), accommodative (focusing), eye movements (tracking), and visual field disorders in both the civilian and military populations. Experienced optometrists provide diagnostic vision evaluations that include an assessment of three areas of visual function including visual integrity, visual efficiency, and visual information processing. Visual integrity includes an assessment of visual acuity, the need for eyeglasses, and the health of the eyes and visual fields. Visual efficiency includes an assessment of binocular vision (eye teaming), accommodative (focusing), and eye movements (tracking). Visual information processing includes an assessment of the patient’s ability to analyze, interpret, and make sense of the visual information. Vision therapy/rehabilitation can be divided into two distinct categories; compensatory rehabilitation and remedial rehabilitation. Compensatory vision rehabilitation (low vision therapy) refers to treatment designed to allow the patient to function more effectively in activities of daily living in spite of the presence of a chronic health problems. The goal is not to eliminate the underlying disorder. Examples include vision rehabilitation for visual impairment secondary to eye disease. Remedial rehabilitation refers to treatment designed to eliminate the underlying vision/auditory problem. Examples include the treatment of visual efficiency problems including eye alignment (binocular vision), focusing (accommodation), tracking (eye movement), visual and auditory processing problems, and vestibular disorders. Professional services include the diagnosis and treatment of patients with hearing and balance disorders. The examination includes a comprehensive hearing and balance assessment, basic diagnostic audiometry, auditory processing assessment, and the provision of hearing aid amplification and assistive listening devices. Treatment Includes aural and vestibular rehabilitation. To make an appointment, please call 215.780.3170 and one of our Appointment Center Pre-Registration Specialists will be in contact with you.